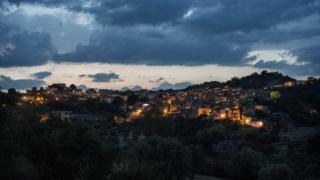 The hilltop medieval village of Riace on Italy's south coast was almost a ghost town 15 years ago. Houses were derelict and the local school was near to closing. The village was in danger of becoming extinct as residents disappeared to northern Italy, and abroad, for jobs during the economic boom. 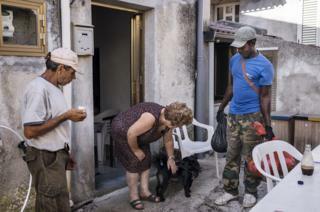 Since then Riace has seen a change in its destiny, by openly welcoming a controlled number of migrants, who live and work as part of the community. This transformation was instigated by the mayor, Domenico Lucano, who set up a scheme, funded by the Italian government, to offer refugees the abandoned apartments and training. It has helped to rebuild both the town's population and economy. "I do nothing more than what I think is right for our little community," says Lucano, who started the pioneering programme in 1998. 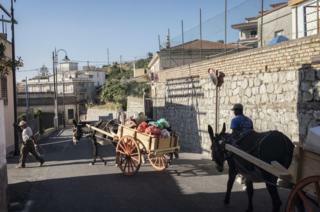 "The multiculturalism, the variety of skills and personal stories which people have brought to Riace have revolutionised what was becoming a ghost town. "There were people without a house here, and there were houses without people here. It's simple." This year, Lucano was named by Fortune magazine as one of the world's 50 greatest leaders. The honour puts him in the company of names such as Pope Francis, Apple chief Tim Cook and Canadian prime minister Justin Trudeau. 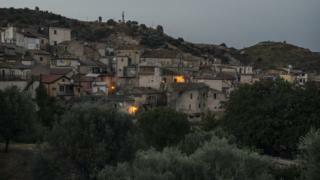 About 450 migrants, drawn from more than 20 countries beyond Europe, are living in Riace - about a quarter of the village's total population. Inevitably, there are some tensions with locals - yet Lucano has earned enough respect to be serving his third term as mayor. Some of the children are originally from Ethiopia but have grown up in Riace and speak fluent Italian, in addition to English and their native tongue. Not all the residents are confident Italian speakers though. Tahira (above) fled Afghanistan and since arriving in Riace has learned embroidery from a resident. She works as an apprentice and is improving her language skills. Her job is part of the European Integration programme for asylum seekers. "What I hope from this story is to spread a message of humanity, hope and anti-racism to the world," says Mayor Lucano (below right). "Others should see how the welcoming of migrants is possible but also beneficial to the host communities. "This policy gave the village a new lease of life, it didn't trigger any wars between the poor, or xenophobic hysteria or fraudulent speculations. 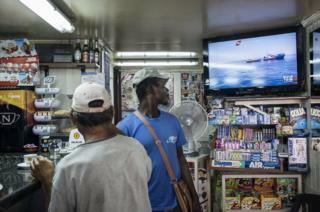 It helped to give new values to the people involved." Local funding has spurred the opening of artisan workshops where migrants like Rawda (above) can earn a wage, learning trades that were dying out locally. The handmade souvenirs are sold to tourists. 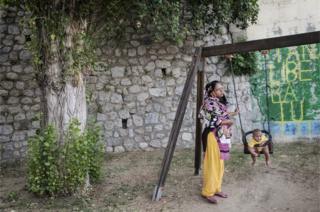 "I don't feel like a foreigner or a stranger here in Riace," says Rawda, who travelled from Somalia with her husband and daughter five years ago. "This is a new life for our family. My daughters couldn't go to school in Somalia. Now I'm feeling really lucky, I can give my children a new future. They'll grow up to be world citizens." Another workshop is run by an Italian potter, Franco (above, centre). "When I started I learned ancient techniques from local potters. Now, while I exhibit my original works in international fairs, I can also teach my knowhow to those guys from all over the world, hopefully giving them important skills to find a job out there." Husband and wife Osayomore and Nicole (above) say they survived a perilous journey across the Mediterranean having been attacked by rebel groups on the beach as they prepared to leave Libya. The women and children were already on board and headed to sea as the men took shelter from bullets on the beach. 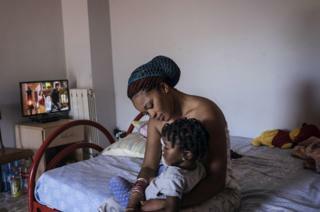 Grace, their daughter, was born nine days after Nicole arrived in Palermo, on Sicily. "I was worried for my wife. She was alone on board, in shock and she didn't know where I was for days," says Osayomore. The arrival of so many refugees means people like Luca (above, bottom left), who works for Protezione Civile (the civilian protection agency), are in demand. "I am proud of Riace and our mayor but I am also worried about the future as there are many more arrivals every day and their needs are great," says Luca. He works long days trying to find jobs for everyone. "With funding, the re-population of Riace is solving the problem of derelict housing, and many feel it gives the town a new lease of life. There are some cultural problems, of course. Not every citizen here is in 'welcome mode'," adds Luca. And not every migrant has settled easily. Sheriffo (above, right), a refugee from Gambia, was rescued by the Italian coastguard 10 months ago and relocated to Upper Riace with his wife. Though they feel welcome, he is struggling to find a permanent job, currently selling goods to tourists on the beach. "There is no job here and the government subsidies is not enough for me and my wife," says Sheriffo. "We found a good welcome but there is lack of employment for locals and for refugees. I'm trying to resist, I'm selling some stuff that my wife buys from another seller, but there is not tourism in this area, I don't know why." For many though, Riace is a safe haven. "I'm happy to be here after a long and tough journey. It has been dangerous for me but I've been most scared for my daughter," says Esther, 25, who travelled from Nigeria. "Thanks to Riace and its mayor, my daughter has a chance for a better future here." So what is the village of Riace doing that others are not? The key, says one migration expert, is its mayor. "[He had] a long-term vision of rejuvenating his area and showed leadership to help his new residents feel welcome," says Manos Moschopoulos, programme officer for Open Society Initiative for Europe. "Riace's model offers migrants the ability to participate in their new society, free from the extreme economic and social pressures many have faced as they tried to earn enough to sustain themselves. Migrants are then able to focus on inclusion, learning the local language, interacting with locals and getting the skills they need to build a better future for themselves."